As 2017 is behind us, it is worthwhile to both look back at what has been driving advertising spending and to estimate which directions it might go in 2018 and beyond. This article will look across the various media channels to evaluate general trends in advertising spending and productivity, as well as other developments, that explain current trends in ad spend -- and where ad spend and media-mix might be going in the years ahead. We begin with the table below, which summarizes spending levels and US trends over the past five years, and with close-in estimates for 2017. As the data indicates, overall ad spend across the seven US channels is expected to amount to about $197.1 billion and to grow at a +3.2% rate for 2017, just at a slightly slower pace than in 2016 and at slightly below the 5-ear average. Across the channels, we see that digital media, particularly, Digital Display advertising, was the growth leader, primarily driven by the acceleration of programmatic media buying across all digital advertising. Modest growth was seen for both TV and Outdoor advertising. By contrast, spending for traditional print FSI coupons dropped about 10%, primarily due to competition from online coupons. Radio and Print media spending was basically flat and weaker, following historical weaknesses for these media. In order to understand media productivity, we need to come up with a broad measure of media output or production. Ultimately, this could be sales outcomes from a very large set of media-mix models. In the absence of that, we have come up with our own measurement called “Ad-Driven Purchase Propensity.” We derive this from an advertising effectiveness copy testing company that asks advertising respondents how viewing specific ads change their purchase intentions towards the advertised brand (1). While this is probably not a perfect measure, we derived this measure across more than 1,300 diverse brands and over 40,000 different ads across all the media channels in the US for 2017. The chart below provides us a general comparison of how estimated media spend by channel in 2017 compares proportionately to our derived “Ad-Driven Purchase Propensity.” As shown from the chart below, there is a general and somewhat surprising concurrence between media spend and our measure of media productivity. Nevertheless, we can see that some channels are more productive and show larger or stronger purchase propensities relative to their spending. These include Print, Outdoor and FSI-based media. 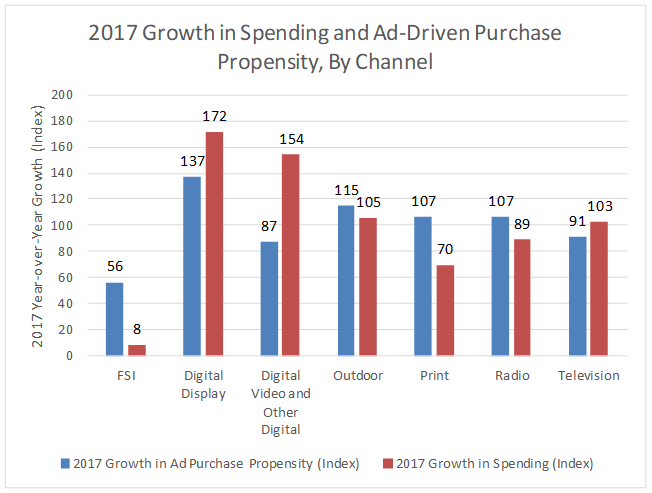 On the other side, while showing the strongest growth in spending, Digital Display ads are showing the lowest overall productivity in the mix, followed by radio. Television showed total productivity somewhere in the middle of the pack. To understand where media spending might be going in 2018 and beyond, we need to see where media productivity is trending and if there has been any alignment between growth in media spending and growth in media productivity. The chart below summarizes growth in media productivity (i.e. purchase propensity) relative to estimated growth in media spend for 2017. What we find is a general alignment (with correlation of about 70%) showing that there is a tendency for growth in media spend to be following growth in media productivity. For example, per the chart below, we see that Digital Display advertising is showing the greatest productivity gain. Much of this is probably due to the greater efficiency afforded by more programmatic media buying; and this certainly explains why digital media benefitted from the largest spending gains in 2017. Following these gains, next in line showing productivity gains is outdoor advertising. Print and Radio advertising each showed above average productivity gains, even though they did not benefit from spending increases. Television and FSI-ads, by contrast suffered the weakest productivity gains in 2017. For more information about Integrated Marketing Across All Media Types, see the ABX resource page of the same name. 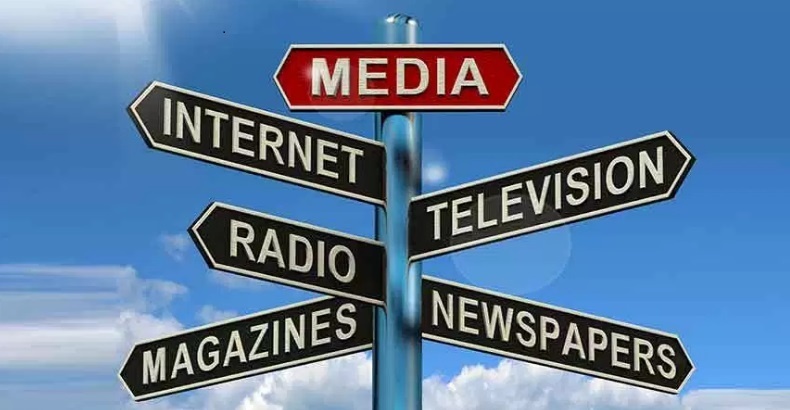 The future and growth of media spend will most likely be a function of some of the strengths and weaknesses that have been pointed out in this article. A summary of these are shown in the table below. Television still remains the most dominant media channel, despite its lower level of productivity. Clearly, this channel continues to have an unequaled advantage for its mass reach. Some ad forms, such as FSI’s, while showing very high productivity, are likely to be challenged by online forms with at least the same, if not higher, productivity at lower distribution costs. Also, despite the efficiency brought forth from programmatic buying, we can not assume that growth in digital spending will continue. Unless there are substantially greater improvements in digital media sell-through, more discipline and less ad fraud, there could be trouble ahead. A rising economy for 2018 portends well for overall advertising spend in 2018. We estimate that the growth in ad spend for 2018 is likely to improve to +4.5 to +5.5%. This sees a continuation of double digit growth in Digital Media. Both Television and Outdoor ad spending should grow about 3 percent; while Print advertising and FSI’s should continue to struggle. In the case of the latter, there is likely to be a continued expansion of online couponing, making traditional newspaper-based FSI’s more at risk. The major risk going forward, particularly for Digital Ad spending is digital ad fraud, which estimates believe affects up to 25 percent of spending and is expected to grow. This is also probably affecting the lower productivity of digital media. Certainly, until there is more success in cleaning up digital ad fraud, digital media spending, itself, will be at risk. (1) Data sources: for the advertising productivity (purchase propensity), we relied on Advertising Benchmark Index (a.k.a. ABX) syndicated creative testing information for 2017. For media spend data we relied on information from eMarketer.com, Statistica, Inc. and Kantar Media. For more on how to relate creative data and spend to revenue lift, see our resource page, "Can Creative Testing Improve ROAS, ROI or Predictive Analytics." Mich ael Wolfe, CEO of Bottom-Line Analytics, brings about 30 years of direct experience in marketing analytics both on the client, ad-agency and consulting side. On the former, Michael has worked for Coca-Cola, Kraft Foods, Kellogg’s and Fisher-Price. He has also consulted with such blue-chip firms as AT&T, McDonald’s, Coca-Cola, Hyatt Corp., L’Oreal, FedEx and more recently Starbucks. Michael has broad experience in marketing analytics covering marketing ROI modeling, social media analytics, pricing and brand strategy; and he has numerous articles on these subjects.